Our first stop was St. George street, the touristy area with shops, restaurants, and attractions. There was something about it that reminded Suzanne of Diagon Alley from the Harry Potter books – not sure why - but maybe because there were house numbers like 42 ½…..
We passed the oldest woodenschoolhouse in the USA first. However, we didn’t go in. 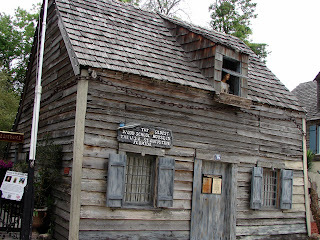 There are a lot of attractions in Saint Augustine and all have an admission price – we wanted to see what really interested us before spending too much money. Well, what interested Brad was cinnamon rolls & coffee at the Spanish Bakery, a restaurant recommended to us for lunch. We were passing by and took a look for lunch later, and there were the cinnamon rolls, and Brad loves his cinnamon rolls, and so there ya have it! :-) We did go back for lunch later and it was great! Soup, roll, cookie and drink for $5.50 – very fresh, very basic, very good. As we continued, we saw a “restaurant” devoted entirely to French fries - French Fry Heaven - Suzanne loves French fries, so we had to try some. Now Suzanne’s a fairly plain eater, normally just a bit of salt on her beloved French fries and she’s good to go, but we went crazy and tried the “potato skins fries” – the first few were good, but then the remaining ones were soggy with the cheese and sour cream. It was worth a try. and eventually found ourselves at the oldest house in the US, occupied since the 1600’s. We decide to go in and take the tour ($8 per person, but we each had a $1 off coupon from the Visitor’s Center, which we’ll get to eventually). 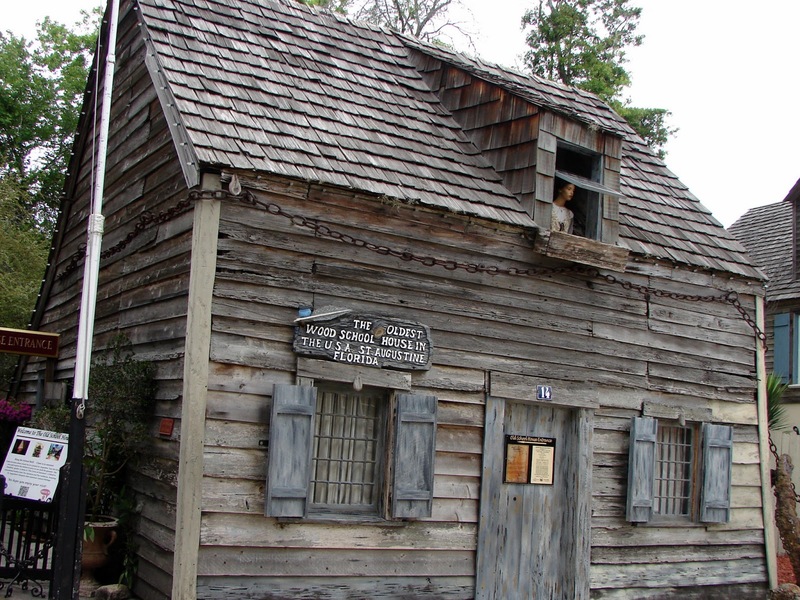 The oldest house began as a two-room home for a Spanish family, was enlarged at a later date when occupied by a British family, renovated later by another English family, then taken back to its original structure when taken over by the St. Augustine Historical Society (the oldest historical society in the US – another “oldest” thing) in 1918. We learned a few interesting things, the most interesting being that in St. Augustine, because the water table is high (6’), each family had its own well, which was important as water-born pathogens were less likely to wipe-out an entire village - if each family had its own well, then any disease would *only* wipe-out that one family. Also, since the water from the well is dirty, each family had its own purifier in the form of local rock that contains a native limestone that is naturally porous and distils the water. We ended up calling it a day and walked back to the parked truck. So we walked the entire area, which was just a few miles, maybe two or three. St. George Street itself is about a mile. There are plenty of trolley cars that one can hop-on/hop-off that will take you around the city to all the tourist destinations. We took two tours of the city that you may find interesting. We took a Segway tour (via Groupon), and we took a walking foodie tour. Both were great and worth the money. Oh yea, we also took a tour of the Flagler College. And don't miss the Lightner museum. Awesome.